I've been singing this song about childhood cancer for seven years now. Seven years of, "go gold... fund research... cure the kids... more than four... give, give, give... please, please, please..." And, let me tell you, it's exhausting. I am fatigued. But I am also obligated to honor Ty and to keep his memory alive by maintaining my promise to him (and to myself) that I will never stop fighting for him and the kids like him. I am his mom, and this is what mom's do. This is the only way I know how to continue taking care of him. What simply amazes me is that there are people who have been on this journey with me every step of the way, and who never left my side after all this time. Many of whom were complete strangers to me before Ty got sick, and who are now my dearest friends. In fact, our entire Board of Directors at the Ty Louis Campbell Foundation didn't even know me before Ty got sick, and they volunteer tirelessly in his memory. I am beyond humbled. Ty Louis Campbell, a boy I never got to meet, has changed my life. Ty passed away from an aggressive pediatric brain cancer in 2012 when he was only five years old. I was only nine years old when I was introduced to Ty’s story, but it immediately grabbed my attention. Pediatric cancer is severely underfunded and due to this, under-researched. I find it so unfair that innocent children are being robbed of their childhoods and that the options to save their lives are ones that are harsh, outdated and usually meant for adults. Did I mention Ty LOVED blue lollipops? Why? 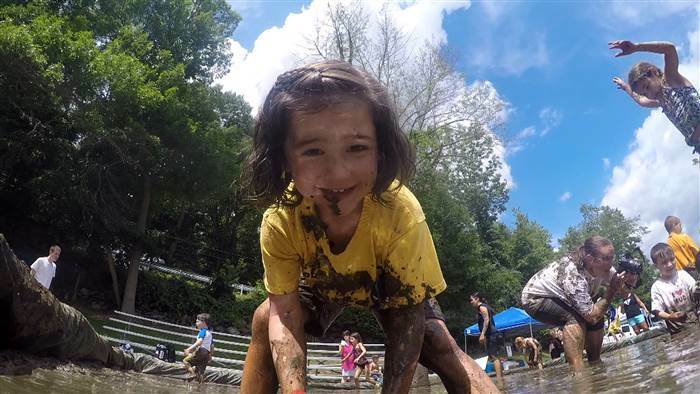 Because to a child they are magical. It isn’t their delicious taste that holds the magic, but the way that it turns your smile blue. Your tongue, lips and teeth all turn blue when eating a blue lollipop and that’s where the magic resides. In honor of TY, I created The Blue Lollipop Project. For every dollar donated to The Blue Lollipop Project, a blue lollipop is sent to a pediatric cancer warrior and all of the money funds pediatric cancer research through the TLC Foundation (the organization founded by Ty’s family in honor of Ty). One hundred percent of the money that the TLC Foundation raises goes toward pediatric cancer research. 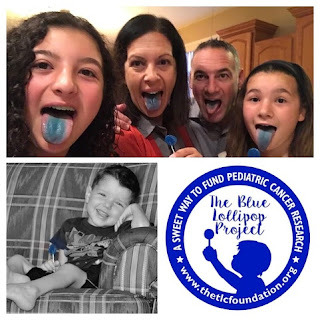 Through the support they have given me, I have partnered with hospitals throughout the United States, raised thousands of dollars for pediatric cancer research and donated thousands of blue lollipops through The BLue Lollipop Project. I continue to work closely with the TLC Foundation to bring blue smiles to kids throughout the country and to best support pediatric cancer research. I hope to continue my project and support the TLC Foundation for many years to come in order to spread the magic of blue lollipops. It is so amazing how something so simple can be so uniting and powerful. How I wish you got to meet him. He would have hugged you and loved you and laughed out loud at your blue lollipops. I wish you could have shared a blue smile with our very special boy. He will always, always be in your heart and watching out for you. There is a palpable connection between you both, and I find such comfort in that. I hope you do, too.